Music is art. It is the art of expressing your thoughts, ideas, emotions and feelings with rhythm and melody. Learning to play an instrument can be a great hobby, especially if you love playing music. One of the most respected and reputable music instruments is the guitar. If you’re a beginner, finding the proper guitar for you might sound like a hard task because there are guitars with different shapes, sizes, forms, types and materials. In this article, we will focus on finding the perfect best acoustic guitar for you and we will break down every feature so you can clearly understand what you are buying. 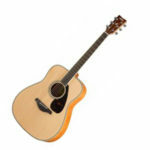 If you are on a budget, you can check out our article on the best acoustic guitars under $200. We went through countless models and spent hundreds of hours researching the best acoustic guitar brands and models while preparing this article with. We did this with the aim for you to be full of knowledge when you finish reading this buying guide. What should you look for when buying a guitar? 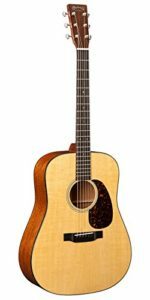 Before we jump into the list about the top acoustic guitars, I want to take a moment to inform you about what you should look for when buying an acoustic guitar. The guitar is made of several parts, with the most important ones being the Headstock, The Fingerboard, Nut, Neck, Body, Waist, Tuning Peg, Bridge & Saddle. Each of those parts play an important role in the outcome of the sound, so you need to understand which materials and types are the best before deciding. One of the most important parts of an acoustic guitar is definitely the body and the neck, and that’s one of the things you should focus the most on during your decision process. All wood types produce a different sound compared to each other. Even though it’s not a huge difference, you will start to notice it when you get used to playing the guitar. If you’re a beginner, you probably know nothing about the wood types. Don’t worry, I am here to help you with that. Alder – Alder is one of the oldest types of wood used for making guitars. A popular brand which uses alder for their products is Fender. When the body is made of alder wood, the sound will come out strong and clear, with lower notes being easier to hear than the higher ones. Sitka Spruce – This wood is also very popular in the acoustic guitar world. Manufacturers prefer this wood type because it’s very lightweight and sturdy at the same time. The tone that comes out because of this wood is very powerful and clear. Koa – Koa is a very dense hardwood which is used for the back side of the instrument and also the sides. It is able to produce a pretty solid tone with good quality. It sounds pretty similar to a mahogany one. Mahogany – It’s pretty commonly used because it’s very durable and cheaper compared to some other wood types. I personally love this wood type, because it can be used to make acoustic guitars which have a great value. Rosewood – When it comes to quality and sound, rosewood is undoubtedly the best. Brazilian rosewood is considered to be the best option, but they are not available in the market anymore. A substitute for that is the Indian Rosewood, which is pretty similar to the Brazilian. It’s not as attractive as the Brazilian one, and it has a bit brighter sound when compared to it. It’s a very hard wood and the tone is generally warmer in instruments made of Rosewood. Mahogany – This type of wood is mostly used on guitar necks because it’s pretty durable and strong. The density of the wood is pretty even, meaning that the risk of warping will be reduced to the minimum. Rosewood – This type of wood mostly is known to smooth out the highs. It mutes the high-frequency overtones, resulting in a strong fundamental that still has all the complexities of mid and low overtones. Maple – Maple is one of the strongest, hardest and most dense wood types out there. That’s why its great for stability. 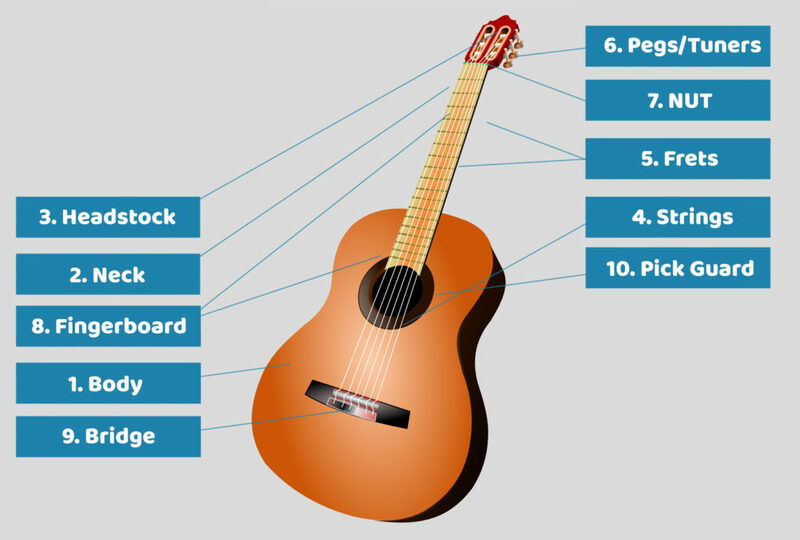 Now that you know all the parts & wood types of guitars, let’s jump into the best acoustic guitars list. 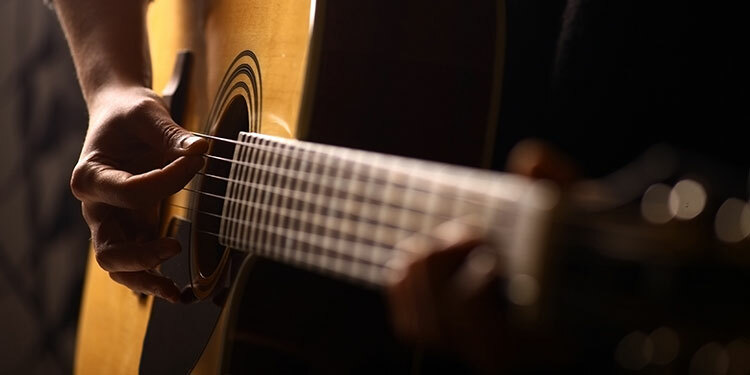 If you’re a left-handed guitar player, you should skip this list and take a look at our best left-handed acoustic guitars list. In that list, we listed the 5 best options for lefties, because it’s almost impossible to play the traditional guitar if you are left-handed. With proper training, you can probably do it, but it’s best to start on a left-handed one so you can learn the ropes. If you’re just starting out and this is the first time you’re buying a guitar, you just can’t go wrong with the Yamaha FG840. People often buy musical instruments to play them for a month or so, and then forget about them. That’s why, instead of spending a large amount of money on a guitar, you should first get a guitar that is affordable and has a lot of things to offer for beginners. One of the most popular options for that is the Yamaha FG840. It looks great and is made of strong materials that ensures a long life for the guitar. The guitar itself has an attractive western body, which is a common thing on most of the best Yamaha Guitars. 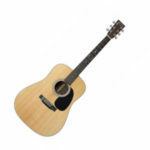 The FG840 comes with a solid spruce top which is a common material used for bodies. What’s interesting about it is that it gets better with age, which means that the longer you use it, the better it will perform. The body and the sides are made of maple wood, whereas the fingerboard & the bridge is purely made of Rosewood. The sound that comes from this guitar is great. Considering the price, this guitar has crisp highs, great mids and has more than enough bass to satisfy even the most demanding users. Wooden things get damaged very easily, but this isn’t the case with this product. Even though it’s pretty cheap compared to some other models out there, Yamaha managed to make a guitar that is very solid and durable without making the price skyrocket, so that’s a great thing. Overall, I would say that this guitar is definitely one of the best out there, especially if you are looking for a guitar that you will play during your free time. This might not be a great option for people that want to seriously learn about them, but it’s great for playing it here and there. For more information, read our Yamaha FG840 review. Everyone buys musical instruments based on the music they like. If you are someone that likes salsa, reggae or any other similar dance music, you will definitely love the Cordoba C9. This guitar has a solid Canadian cedar top, mahogany back & sides, rosewood fingerboard, and an Indian Rosewood bridge. If you paid attention earlier when we talked about the materials, you will know that these materials are very strong and durable. Considering the materials used to construct this instrument, it managed to be a pretty lightweight guitar. That’s a great thing because this means that it’s very easy to handle and take it with you wherever you go. 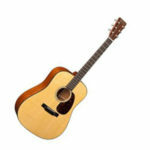 This guitar makes a very round and warm sound which has enough power to satisfy even the most demanding listeners. What I like the most about this guitar is that you can use it for playing it at home for fun or even take it to concerts. 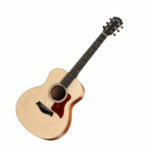 It can be considered as a multi-purpose guitar that can be a great fit for any event or any occasion. Overall, I would say that this guitar is a great option for people that want to learn to play the guitar and also move to play it professionally in the future because it’s a perfect fit for both students and professional players, similar to the Epiphone guitars. If you got your eye on this guitar, i recommend you read the full Cordoba C9 Review. The GS Mini has been created with travelers in mind. Even though it didn’t make it to our best travel acoustic guitars list, it’s hard to beat. It’s a very portable option which you can take with you wherever you go. Since it is smaller than average guitars, you can take it with you on a plane, on a hike or on a car ride. Portability is a very important factor when it comes to guitars, so Taylor gets a big thumbs up in that field. With the Taylor GS Mini acoustic guitar, you definitely get what you pay for. It has a solid Sitka spruce top, sapele back & sides and an ebony fretboard. This is very important because guitars with these materials are usually more expensive, and I think that Taylor did a great job with this particular model. It has a pretty loud sound which sounds nice. Because it’s a small option, we were amazed at how loud it was. I was completely shocked and it continues to stun me every time I play it. The tone itself is bright & warm. Professional players do not prefer mini guitars, because they usually lack bass but this isn’t the case with the GS mini. 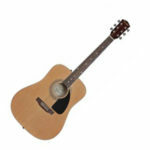 The GS mini can also be considered as a great acoustic guitar for kids aged between 13 and 16. 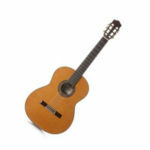 Teens of that age usually find full-sized guitars hard to play, so the proportions of the GS Mini are perfect for them. 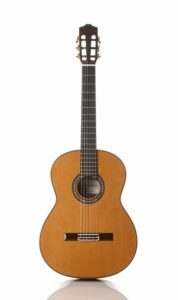 Overall, I would recommend this guitar to everyone that is looking for a smaller instrument that can output a large volume and doesn’t cost too much, and that is one of the main reasons why this guitar is on our best taylor guitars list. Read our full Taylor GS Mini review here. As it may be already well known, Godin is the brains behind most of the brands such as Art & Lutherie, Normans, La Patrie and many more other brands that have gathered numerous awards in the music making industry. It is also a guitar that can be commonly found on best seagull guitar lists over the web. Yet, out of all of Godin’s designs, probably the most groundbreaking is the Seagull S6. Safe to say that there is not much to look at when your eyes meet this guitar and that’s because Seagull S6 is highly known in that manner that the quality sound it produces makes you overlook its aesthetics. There’s nothing truly extraordinary about it, there’s no sumptuous inlay, no cutaway and the design is mainly traditional. But, let that not carry you away from the fact that Seagull S6 has a masterfully crafted construction which boosts the guitar’s playability to convey the smoothest quality and a serene sound. Part of what makes this a quality and a durable guitar is the material that Seagull Guitars use. Instead of the usual laminate spruce wood tops you find on most of the traditional guitars, Seagull S6 uses a well-built cedar top. It is common in the guitar-making sphere that the guitar face is one of the main factors in creating the tone of a guitar, so this well-constructed wood top is a difference maker. Tonally, the S6 conveys a maturity far beyond its years. This is the cedar top for you. In conclusion, this guitar is sufficiently good for beginners, but versatile enough and satisfying for veterans. Its sound is delightful and the design has a lustrous feel to it. In our detailed review of the Seagull S6, we take a look at its body parts too, so make sure you read that too! Speaking of entry-level guitars for people who are just starting to learn about guitars you have to look no further than the craftsmanship products of the most affirming American manufacturer Fender. With a century of experience in the guitar making business, you can be assured to buy a carefully crafted guitar from this brand which never disappoints when it comes to sound quality and is very affordable. When it comes to Fender FA-100 you can see without a doubt that this guitar was created specifically for the people who are just grasping the concept of what it means to play an instrument and with the crisp sound quality it provides, it gives you a simpler way of understanding the instrument and helps you improve your skills rapidly. 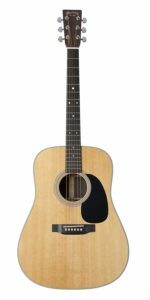 Its simplicity allows Fender FA-100 to convey a crisp clear vibrant sound and its dreadnought body has a clean, unchallenging feel, making it a great acoustic guitar for beginners. FA-100 has a laminated spruce top, the back & sides are made of basswood which helps the instrument maintain the affordable cost. You can see why Fender FA-100 is suggested by many professional guitar teachers as a first guitar. Fender FA-100 is easy to use and its size provides you with the opportunity to take it with you on a road trip and play at some events such as camping with friends, or maybe just playing at a family event, and the sound it provides assures you with the confidence you need to play at a party over your friends house. The Fender FA-100 also earned its spot on our best fender guitars list. If you have ever encountered someone playing on Taylor guitars or have had the chance yourself to play on a Taylor guitar, you know you were witnessing a premium high-quality sound and a dreadnought long-lasting build. Its unique sound, and design elements classify this guitar as an excellent choice for both beginners, and professional players as well, but it can also be fun for just about anyone at any level. If you’re fairly new to the Taylor 110e then this guitar would definitely be the choice for you, it is a well rounded acoustic guitar with awesome sound quality and a perfect projection of tonality. Thankful to the size it has, you can take this fine piece of craft with you just about anywhere without taking overwhelmingly much space. Even though their life span may not be at the mid-range, its tonewood maturity will improve similarly with the sound quality at which it’s projected. 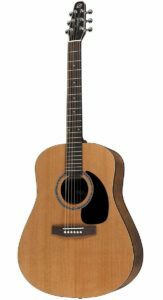 The Taylorr 110e guitar has a beautiful well-crafted Sitka Spruce top with layered walnut sides and back, it has a Sapele neck and ebony fingerboard. Sitka spruce is a dense, wood that is fairly strong, providing the kind of vibration which makes room for the sound to produce such great quality. The Taylor 110e provides you with an inbuilt pickup, the “e” in the name stands for the fact that you can set it up with electronics, which means you can play it plugged in or unplugged. It has an all round accommodating pickup system. This guitar being a dreadnought is mostly suitable for flat-picking and strumming, but it also resonates well with finger-picking too if that’s your approach. It’s an amazing guitar overall, and i’d recommend you read our full review on the Taylor 110e. When you’re listing some of the best dreadnoughts you cannot miss out on the “Martin D-18” the benchmark for all dreads. The “Martin D-18” dreadnought has helped exemplify what an acoustic guitar can and should be, and there’s no surprise to why this model is the most sought-after acoustic guitar design in the world. With a powerful dreadnought design and a great sounding combo of solid Sticka spruce top and mahogany sides and back, a smooth fingerboard, a bone nut and a saddle for improved intonation you’re bound to find yourself entertained with this guitar for a long lasting period of time. To conclude the purpose of firm mahogany for the back and sides further enhances this dreadnought’s precise, distinct treble and a warm, middling bass. Although Martin D-16 is known for its great tonality, a well built and stable design this guitar offers many other characteristics that are bound to please the player. Here you can witness Martin’s typically high standard touch of presentation correspond to, if not surpassed. Overall, i honestly love the sound that comes out from this guitar, and i would recommend it to everyone that is looking to buy a guitar that sounds and preforms great. In our Martin D-18 Review, we called this guitar the king of acoustic guitars, so I’d say that it’s definitely worth it. Acoustic guitars and hidden gems. When you come across the Martin D-16 RGT you know you’ve stumbled upon a hidden gem in the Martin guitars lineup. The D-16RGT even though it features similar installations to the standard series Martin D-28, this gem delivers another sense of tone with a significant value. On the full review of Martin D-16RGT, we made sure to mention all of its pros and cons. Featuring a solid Sitka Spruce top and East Indian Rosewood sides and back the Martin D16-RGT offers a glossy finish while the back and sides are complimented with satin. Furthermore, the neck is polished with solid Spanish Cedar. Martin uses wood to craft the body of the dreadnought and its qualitative craftsmanship shows. Even though the sound of the Martin D-16 RGT has been continuously compared to the amazing Martin D-28, with the D-16RGT you’ll get a richer hurling bass, typical to the Martin guitars lineup. Nevertheless, Martin D-16RGT produces a well-balanced and fine distinction than its standard Martin guitars cousins provide. This easy-to-play guitar features an altered low neck profile. The Martin D-16 RGT even though in the Martin guitar lineup falls in the category of mid-range acoustics guitars, in comparison to other guitars this appears to be far more superior thanks to its impeccable construction and the overall feel which gives you a great dose of stylishness and everlasting elegance. 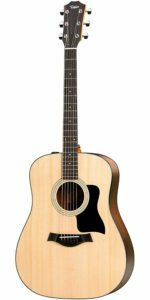 Overall this gem is best known for its design qualities and the everlasting life span, if you need a stable guitar that can provide you with quality sound and stylish look Martin D-16 will fulfill that purpose. 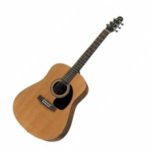 Being the best selling acoustic guitar of all times Yamaha FG800 provides you with the best option If you’re looking for well-balanced guitar who provides a high-quality sound with a well solid build which won’t take lots of money off the bank balance for the training sessions you’re about to take, then you’ve found your sure bang for your acoustic guitar. 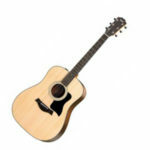 You will find with Yamaha FG800 acoustic guitar that it is easily adaptable for beginners and experienced players alike. The headstock is equipped with a set of sealed tuners that help the guitar stay in tune, the urea nut and saddle go along with a standard rosewood bridge at the bottom. The FG800 offers one of the greatest sounds you can witness on a budget acoustic. 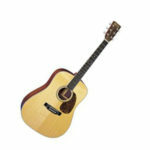 It’s blasting and has a very rich and vibrant sound which is a result of the dreadnought shaped body. Its tone is lighter but nonetheless, it provides you with very sweet and warm color. The benefit of having a robust dreadnought is that it gives the guitar a powerful sound to them. the Yamaha FG800 stands out compared to any other dreadnoughts you’ll find in this a price range. While the sound it produces is not as powerful as the most of the guitars that fall in the expensive price range, anyone who’s a starter should be grateful to have access in this sort of quality sound without breaking its bank. We saved the best for last. The looks, the sound, the quality of the woods used to construct this guitar are all perfect. This guitar is definitely one of the best acoustic guitars out there in every aspect and can be easily compared with some of the best Gibson guitars. I don’t even want to talk about the workmanship on this guitar because there is literally nothing to criticize it about, and I hate that. Everything about it perfect. For the back and the sides of the D-28 they used East Indian Rosewood and for the top they used the traditional solid sitka spruce top, meaning the guitar is very well built. It’s pretty hard to describe the tone of the D-28. Let’s do it like this – think of the best guitars you played in your life, and mix them all into one. That’s what you will get with the Martin D-28. The balance of the sound is great and the overall sound that comes out of it is very pleasing. Good things come with a high price, and that is also the case with this guitar. It’s pretty expensive compared to some other models we talked about in this list, but i think that every penny is worth it. I wouldn’t recommend this guitar to beginners, because it’s way more than what they can handle. If you’ve been playing your guitar for a while and you are looking for an upgrade, then this is the perfect option for you. If you decide to go with this option, you won’t have to look for any new acoustic guitars ever, because this guitar can basically do it all. 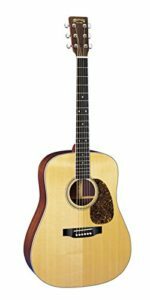 This guitar is one of our all-time favorites, and if you’re a frequent browser of our website, you will know that we mentioned the Martin D-28 in almost all of our top lists, such as the best martin guitars one. It’s one of the few guitars that doesn’t have any cons (as we mentioned in our Martin D-28 Review), and that’s a great thing to note.